This article is about the payment system. For The Price Is Right game, see Credit Card (pricing game). A credit card is part of a system of payments named after the small plastic card issued to users of the system. It is a card entitling its holder to buy goods and services based on the holder's promise to pay for these goods and services. The issuer of the card grants a line of credit to the consumer (or the user) from which the user can borrow money for payment to a merchant or as a cash advance to the user. Usage of the term "credit card" to imply a credit card account is a metonym. A credit card is different from a charge card, where a charge card requires the balance to be paid in full each month. In contrast, credit cards allow the consumers to 'revolve' their balance, at the cost of having interest charged. Most credit cards are issued by local banks or credit unions, and are the shape and size specified by the ISO/IEC 7810 standard as ID-1. This is defined as 85.60 × 53.98 mm in size. When a purchase is made, the credit card user agrees to pay the card issuer. The cardholder indicates consent to pay by signing a receipt with a record of the card details and indicating the amount to be paid or by entering a personal identification number (PIN). Also, many merchants now accept verbal authorizations via telephone and electronic authorization using the Internet, known as a 'Card/Cardholder Not Present' (CNP) transaction. Electronic verification systems allow merchants to verify that the card is valid and the credit card customer has sufficient credit to cover the purchase in a few seconds, allowing the verification to happen at time of purchase. The verification is performed using a credit card payment terminal or Point of Sale (POS) system with a communications link to the merchant's acquiring bank. Data from the card is obtained from a magnetic stripe or chip on the card; the latter system is in the United Kingdom and Ireland commonly known as Chip and PIN, but is more technically an EMV card. Other variations of verification systems are used by eCommerce merchants to determine if the user's account is valid and able to accept the charge. These will typically involve the cardholder providing additional information, such as the security code printed on the back of the card, or the address of the cardholder. Each month, the credit card user is sent a statement indicating the purchases undertaken with the card, any outstanding fees, and the total amount owed. After receiving the statement, the cardholder may dispute any charges that he or she thinks are incorrect (see Fair Credit Billing Act for details of the US regulations). Otherwise, the cardholder must pay a defined minimum proportion of the bill by a due date, or may choose to pay a higher amount up to the entire amount owed. The credit issuer charges interest on the amount owed if the balance is not paid in full (typically at a much higher rate than most other forms of debt). Some financial institutions can arrange for automatic payments to be deducted from the user's bank accounts, thus avoiding late payment altogether as long as the cardholder has sufficient funds. Credit card advertising regulations include Schumer's box disclosure requirements. A large fraction of junk mail consists of credit card offers created from lists provided by the major credit reporting agencies. In the United States, the three major US credit bureaus (Equifax, TransUnion and Experian) allow consumers to opt out from related credit card solicitation offers via its Opt Out Pre Screen program. For example, if a user had a $1,000 transaction and repaid it in full within this grace period, there would be no interest charged. If, however, even $1.00 of the total amount remained unpaid, interest would be charged on the $1,000 from the date of purchase until the payment is received. The precise manner in which interest is charged is usually detailed in a cardholder agreement which may be summarized on the back of the monthly statement. The general calculation formula most financial institutions use to determine the amount of interest to be charged is APR/100 x ADB/365 x number of days revolved. Take the Annual percentage rate (APR) and divide by 100 then multiply to the amount of the average daily balance (ADB) divided by 365 and then take this total and multiply by the total number of days the amount revolved before payment was made on the account. Financial institutions refer to interest charged back to the original time of the transaction and up to the time a payment was made, if not in full, as RRFC or residual retail finance charge. Thus after an amount has revolved and a payment has been made, the user of the card will still receive interest charges on their statement after paying the next statement in full (in fact the statement may only have a charge for interest that collected up until the date the full balance was paid...i.e. when the balance stopped revolving). The main benefit to each customer is convenience. Compared to debit cards and checks, a credit card allows small short-term loans to be quickly made to a customer who need not calculate a balance remaining before every transaction, provided the total charges do not exceed the maximum credit line for the card. Credit cards also provide more fraud protection than debit cards. In the UK for example, the bank is jointly liable with the merchant for purchases of defective products over £100. Credit cards with low introductory rates are limited to a fixed term, usually between 6 and 12 months after which a higher rate is charged. As all credit cards assess fees and interest, some customers become so encumbered with their credit debt service that they are driven to bankruptcy. Credit cards will often stipulate a default rate of 20 to 30 percent in the event a payment is missed. That is, if a consumer misses a payment, the rate will automatically increase to a very burdensome level. The practice of universal default, in which the default rate is applied to a card in good standing merely by missing a payment on an unrelated account, greatly magnifies this harm. This can lead to a snowball effect in which the consumer is drowned by unexpectedly high interest rates. Further most card holder agreements enable the issuer to arbitrarily raise the interest rate for any reason they see fit. Merchants that accept credit cards must pay interchange fees and discount fees on all credit-card transactions. However, merchants are usually barred by their credit agreements from passing these fees directly to the credit card customers, or from setting a minimum transaction amount. The result, at least in the United States, is that even consumers that do not use credit cards experience higher prices from most merchants to cover the hidden transaction fees afforded for credit cards. In the United States in 2008, credit card companies collected a total of $48 billion in interchange fees, or an average of $427 per family, with an average fee rate of about 2% per transaction. Since these fees can't be passed directly to credit card customers, they become a hidden part of the prices offered by any merchant to all of its customers. A credit card's grace period is the time the customer has to pay the balance before interest is assessed on the outstanding balance. Grace periods vary, but usually range from 20 to 50 days depending on the type of credit card and the issuing bank. Some policies allow for reinstatement after certain conditions are met. 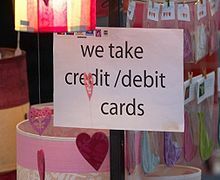 An example of street markets accepting credit cards. Most simply display the logos (shown in the upper-left corner of the sign) of all the cards they accept. For merchants, a credit card transaction is often more secure than other forms of payment, such as checks, because the issuing bank commits to pay the merchant the moment the transaction is authorized, regardless of whether the consumer defaults on the credit card payment (except for legitimate disputes, which are discussed below, and can result in charges back to the merchant). In most cases, cards are even more secure than cash, because they discourage theft by the merchant's employees and reduce the amount of cash on the premises. Prior to credit cards, each merchant had to evaluate each customer's credit history before extending credit. That task is now performed by the banks which assume the credit risk. Credit cards can also aid in securing a sale, especially if the customer does not have enough cash on his or her person or checking account. Merchants are charged many fees for the privilege of accepting credit cards. The merchant may be charged a discount rate of 1%-3%+ of each transaction obtained through a credit card. Usually, the merchant will also pay a variable charge, called an interchange rate, for each transaction. Thus in some instances of very low value transactions, use of credit cards may actually cause the merchant to lose money on the transaction. Merchants must accept these transactions as part of their costs to retain the privilege of accepting credit card transactions. Merchants with very low average transaction prices or very high average transaction prices are more averse to accepting credit cards. But rates are often reduced in an attempt to include more of these types of merchants. In certain countries, merchants are required to pay the acquiring banks a monthly terminal rental fee, if the terminals are provided by the acquiring banks. However larger merchants can apply to the acquiring banks for waivers of the fees which the acquiring banks usually obliged. Smaller merchants may not been able to get waivers from the acquiring banks and have to absorb the terminal rental fees as part of their cost of accepting credit cards. Chargebacks: A chargeback is an event in which money in a merchant account is held due to a dispute relating to the transaction. Chargebacks are typically initiated by the cardholder. In the event of a chargeback, the issuer returns the transaction to the acquirer for resolution. The acquirer then forwards the chargeback to the merchant, who must either accept the chargeback or contest it. A merchant is responsible for the chargeback only if she has violated the card acceptance procedures as per the merchant agreement with card acquirers. Secured credit cards are an option to allow a person with a poor credit history or no credit history to have a credit card which might not otherwise be available. They are often offered as a means of rebuilding one's credit. Fees and service charges for secured credit cards often exceed those charged for ordinary non-secured credit cards, however, for people in certain situations, (for example, after charging off on other credit cards, or people with a long history of delinquency on various forms of debt), secured cards can often be less expensive in total cost than unsecured credit cards, even including the security deposit. A prepaid credit card is not a credit card, since no credit is offered by the card issuer: the card-holder spends money which has been "stored" via a prior deposit by the card-holder or someone else, such as a parent or employer. However, it carries a credit-card brand (Visa, MasterCard, American Express or Discover) and can be used in similar ways just as though it were a regular credit card. After purchasing the card, the cardholder loads the account with any amount of money, up to the predetermined card limit and then uses the card to make purchases the same way as a typical credit card. Prepaid cards can be issued to minors (above 13) since there is no credit line involved. The main advantage over secured credit cards (see above section) is that you are not required to come up with $500 or more to open an account. With prepaid credit cards you are not charged any interest but you are often charged a purchasing fee plus monthly fees after an arbitrary time period. Many other fees also usually apply to a prepaid card. Because of the many fees that apply to obtaining and using credit-card-branded prepaid cards, the Financial Consumer Agency of Canada describes them as "an expensive way to spend your own money". The agency publishes a booklet, "Pre-paid cards", which explains the advantages and disadvantages of this type of prepaid card. Credit card security relies on the physical security of the plastic card as well as the privacy of the credit card number. Therefore, whenever a person other than the card owner has access to the card or its number, security is potentially compromised. Once, merchants would often accept credit card numbers without additional verification for mail order purchases. It's now common practice to only ship to confirmed addresses as a security measure to minimise fraudulent purchases. Some merchants will accept a credit card number for in-store purchases, whereupon access to the number allows easy fraud, but many require the card itself to be present, and require a signature. A lost or stolen card can be cancelled, and if this is done quickly, will greatly limit the fraud that can take place in this way. For internet purchases, there is sometimes the same level of security as for mail order (number only) hence requiring only that the fraudster take care about collecting the goods, but often there are additional measures. European banks can require a cardholder's security PIN be entered for in-person purchases with the card. The low security of the credit card system presents countless opportunities for fraud. [according to whom?] This opportunity has created a huge[specify] black market in stolen credit card numbers, which are generally used quickly before the cards are reported stolen. Most internet fraud is friendly fraud. The rest is done through the use of stolen credit card information which is obtained in many ways, the simplest being copying information from retailers, either online or offline. Despite efforts to improve security for remote purchases using credit cards, systems with security holes are usually the result of poor implementations of card acquisition by merchants. For example, a website that uses SSL to encrypt card numbers from a client may simply email the number from the webserver to someone who manually processes the card details at a card terminal. Naturally, anywhere card details become human-readable before being processed at the acquiring bank, a security risk is created. However, many banks offer systems where encrypted card details captured on a merchant's web server can be sent directly to the payment processor. Controlled Payment Numbers which are used by various banks such as Citibank (Virtual Account Numbers), Discover (Secure Online Account Numbers, Bank of America (Shop Safe), 5 banks using eCarte Bleue and CMB's Virtualis in France, and Swedbank of Sweden's eKort product are another option for protecting one's credit card number. These are generally one-time use numbers that front one's actual account (debit/credit) number, and are generated as one shops on-line. They can be valid for a relatively short time, for the actual amount of the purchase, or for a price limit set by the user. Their use can be limited to one merchant if one chooses. The effect of this is the users real account details are not exposed to the merchant and its employees. If the number the merchant has on their database is compromised, it would be useless to a thief after the first transaction and will be rejected if an attempt is made to use it again. The same system of controls can be used on standard real plastic as well. For example if a consumer has a chip and pin (EMV) enabled card they can limit that card so that it be used only at point of sale locations (i.e restricted from being used on-line) and only in a given territory (i.e only for use in Canada). 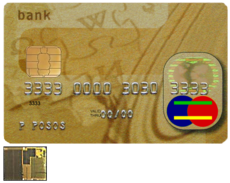 This technology provides the option for banks to support many other controls too that can be turned on and off and varied by the credit card owner in real time as circumstances change (i.e, they can change temporal, numerical, geographical and many other parameters on their primary and subsidiary cards). Apart from the obvious benefits of such controls: from a security perspective this means that a customer can have a chip and pin card secured for the real world, and limited for use in the home country assuming it is totally chip and pin. In this eventuality a thief stealing the details will be prevented from using these overseas in non chip and pin (EMV) countries. Similarly the real card can be restricted from use on-line so that stolen details will be declined if this tried. Then when card users shop online they can use virtual account numbers. In both circumstances an alert system can be built in notifying a user that a fraudulent attempt has been made which breaches their parameters, and can provide data on this in real time. This is the optimal method of security for credit cards, as it provides very high levels of security, control and awareness in the real and virtual world. Furthermore it requires no changes for merchants at all and is attractive to users, merchants and banks, as it not only detects fraud but prevents it. The Federal Bureau of Investigation and U.S. Postal Inspection Service are responsible for prosecuting criminals who engage in credit card fraud in the United States, but they do not have the resources to pursue all criminals. In general, federal officials only prosecute cases exceeding US $5,000 in value. Three improvements to card security have been introduced to the more common credit card networks but none has proven to help reduce credit card fraud so far. First, the on-line verification system used by merchants is being enhanced to require a 4 digit Personal Identification Number (PIN) known only to the card holder. Second, the cards themselves are being replaced with similar-looking tamper-resistant smart cards which are intended to make forgery more difficult. The majority of smart card (IC card) based credit cards comply with the EMV (Europay MasterCard Visa) standard. Third, an additional 3 or 4 digit Card Security Code (CSC) is now present on the back of most cards, for use in "card not present" transactions. Stakeholders at all levels in electronic payment have recognized the need to develop consistent global standards for security that account for and integrate both current and emerging security technologies. They have begun to address these needs through organizations such as PCI DSS and the Secure POS Vendor Alliance. When a consumer becomes severely delinquent on a debt (often at the point of six months without payment), the creditor may declare the debt to be a charge-off. It will then be listed as such on the debtor's credit bureau reports (Equifax, for instance, lists "R9" in the "status" column to denote a charge-off.) The item will include relevant dates, and the amount of the bad debt. In the United States, as the charge off number climbs or becomes erratic, officials from the Federal Reserve take a close look at the finances of the bank and may impose various operating strictures on the bank, and in the most extreme cases, may close the bank entirely. Many credit card customers receive rewards, such as frequent flyer points, gift certificates, or cash back as an incentive to use the card. Rewards are generally tied to purchasing an item or service on the card, which may or may not include balance transfers, cash advances, or other special uses. Depending on the type of card, rewards will generally cost the issuer between 0.25% and 2.0% of the spread. Networks such as Visa or MasterCard have increased their fees to allow issuers to fund their rewards system. Some issuers discourage redemption by forcing the cardholder to call customer service for rewards. On their servicing website, redeeming awards is usually a feature that is very well hidden by the issuers. Others encourage redemption for lower cost merchandise; instead of an airline ticket, which is very expensive to an issuer, the cardholder may be encouraged to redeem for a gift certificate instead. With a fractured and competitive environment, rewards points cut dramatically into an issuer's bottom line, and rewards points and related incentives must be carefully managed to ensure a profitable portfolio. Unlike unused gift cards, in whose case the breakage in certain US states goes to the state's treasury, unredeemed credit card points are retained by the issuer. In addition to fees paid by the card holder, merchants must also pay interchange fees to the card-issuing bank and the card association. For a typical credit card issuer, interchange fee revenues may represent about a quarter of total revenues..
Interest charges vary widely from card issuer to card issuer. Often, there are "teaser" rates in effect for initial periods of time (as low as zero percent for, say, six months), whereas regular rates can be as high as 40 percent. In the U.S. there is no federal limit on the interest or late fees credit card issuers can charge; the interest rates are set by the states, with some states such as South Dakota, having no ceiling on interest rates and fees, inviting some banks to establish their credit card operations there. Other states, for example Delaware, have very weak usury laws. The teaser rate no longer applies if the customer doesn't pay his bills on time, and is replaced by a penalty interest rate (for example, 24.99%) that applies retroactively. Cash advances and convenience cheques (often 3% of the amount). The Credit CARD Protection Act of 2009, signed into law by President Obama, will require that consumers "opt-in" to over-limit charges. Consumers who choose not to opt-in will be unable to make purchases over the limit; the card will simply be declined and no fees will be imposed. This legislation took effect on February 22, 2010. The Charga-Plate was an early predecessor to the credit card and used in the U.S. from the 1930s to the late 1950s. It was a 2 1/2" x 1 1/4" rectangle of sheet metal, similar to a military dog tag, and embossed with the customer's name, city and state. It held a small paper card for a signature. In recording a purchase, the plate was laid into a recess in the imprinter, with a paper "charge slip" positioned on top of it. The record of the transaction included an impression of the embossed information, made by the imprinter pressing an inked ribbon against the charge slip. Charga-Plate was a trademark of Farrington Manufacturing Co. Charga-Plates were issued by large-scale merchants to their regular customers, much like department store credit cards of today. In some cases, the plates were kept in the issuing store rather than held by customers. When an authorized user made a purchase, a clerk retrieved the plate from the store's files and then processed the purchase. Charga-Plates speeded back-office bookkeeping that was done manually in paper ledgers in each store, before computers. The concept of customers paying different merchants using the same card was implemented in 1950 by Ralph Schneider and Frank X. McNamara, founders of Diners Club, to consolidate multiple cards. The Diners Club, which was created partially through a merger with Dine and Sign, produced the first "general purpose" charge card, and required the entire bill to be paid with each statement. That was followed by Carte Blanche and in 1958 by American Express which created a worldwide credit card network (although these were initially charge cards that acquired credit card features after BankAmericard demonstrated the feasibility of the concept). However, until 1958, no one had been able to create a working revolving credit financial instrument issued by a third-party bank that was generally accepted by a large number of merchants (as opposed to merchant-issued revolving cards accepted by only a few merchants). A dozen experiments by small American banks had been attempted (and had failed). In an odd coincidence, both of the products that finally succeeded were born in the U.S. state of California. In September 1958, Bank of America launched the BankAmericard in Fresno, California. BankAmericard became the first successful recognizably modern credit card (although it underwent a troubled gestation during which its creator resigned), and with its overseas affiliates, eventually evolved into the Visa system. In 1966, the ancestor of MasterCard was born when a group of California banks established Master Charge to compete with BankAmericard; it received a significant boost when Citibank merged its proprietary Everything Card (launched in 1967) into Master Charge in 1969. Early credit cards in the U.S., of which BankAmericard was the most prominent example, were mass produced and mass mailed to bank customers who were thought to be good credit risks; that is, they were unsolicited. These mass mailings were known as "drops" in banking terminology, and were outlawed in 1970 due to the financial chaos that they caused, but not before 100 million credit cards had been dropped into the U.S. population. After 1970, only credit card applications could be sent unsolicited in mass mailings. The fractured nature of the U.S. banking system under the Glass-Steagall Act meant that credit cards became an effective way for those who were traveling around the country to move their credit to places where they could not directly use their banking facilities. In 1966 Barclaycard in the UK launched the first credit card outside of the U.S. In contrast, although having reached very high adoption levels in the US, Canada and the UK, it is important to note that many cultures were much more cash-oriented in the latter half of the twentieth century, or had developed alternative forms of cash-less payments, such as Carte bleue or the Eurocard (Germany, France, Switzerland, and others). In these places, the take-up of credit cards was initially much slower. It took until the 1990s to reach anything like the percentage market-penetration levels achieved in the US, Canada, or the UK. In many countries acceptance still remains poor as the use of a credit card system depends on the banking system being perceived as reliable. Of particular note is Japan, which remains a very cash oriented society, with credit card adoption being limited to only the largest of merchants, although an alternative system based on RFIDs inside cellphones has seen some acceptance. In contrast, because of the legislative framework surrounding banking system overdrafts, some countries, France in particular, were much faster to develop and adopt chip-based credit cards which are now seen as major anti-fraud credit devices. The design of the credit card itself has become a major selling point in recent years. The value of the card to the issuer is often related to the customer's usage of the card, or to the customer's financial worth. This has led to the rise of Co-Brand and Affinity cards - where the card design is related to the "affinity" (a university, for example) leading to higher card usage. In most cases a percentage of the value of the card is returned to the affinity group. Another controversial area is the universal default feature of many North American credit card contracts. When a cardholder is late paying a particular credit card issuer, that card's interest rate can be raised, often considerably. With universal default, a customer's other credit cards, for which the customer may be current on payments, may also have their rates and/or credit limit changed. The universal default feature allows creditors to periodically check cardholders' credit portfolios to view trade, allowing these other institutions to decrease the credit limit and/or increase rates on cardholders who may be late with another credit card issuer. Being late on one credit card will potentially affect all the cardholder's credit cards. Citibank voluntarily stopped this practice in March 2007 and Chase stopped the practice in November 2007. The fact that credit card companies can change the interest rate on debts that were incurred when a different rate of interest was in place is similar to adjustable rate mortgages where interest rates on current debt may rise. However, in both cases this is agreed to in advance, and is a trade off that allows a lower initial rate as well as the possibility of an even lower rate (mortgages, if interest rates fall) or perpetually keeping a below-market rate (credit cards, if the user makes his debt payments on time). It should be noted that the Universal Default practice was actually encouraged by Federal Regulators, particularly those at the Office of the Comptroller of the Currency (OCC) as a means of managing the changing risk profiles of cardholders. In the United States, until 1984 federal law prohibited surcharges on card transactions. Although the federal Truth in Lending Act provisions that prohibited surcharges expired that year, a number of states have since enacted laws that continue to outlaw the practice; California, Colorado, Connecticut, Florida, Kansas, Massachusetts, Maine, New York, Oklahoma, and Texas have laws against surcharges. As of 2006, the United States probably had one of the world's if not the top ratio of credit cards per capita, with 984 million bank-issued Visa and MasterCard credit card and debit card accounts alone for an adult population of roughly 220 million people. The credit card per US capita ratio was nearly 4:1 as of 2003 and as high as 5:1 as of 2006. ^ a b "How Visa, Using Card Fees, Dominates a Market". New York Times. January 4, 2010. http://www.nytimes.com/2010/01/05/your-money/credit-and-debit-cards/05visa.html?em=&pagewanted=all. Retrieved 2010-01-06. "The fees, roughly 1 to 3 percent of each purchase, are forwarded to the cardholder’s bank to cover costs and promote the issuance of more Visa cards." ^ a b c d "Credit Cards and You - About Pre-paid Cards". Financial Consumer Agency of Canada. Archived from the original on 2007-03-07. http://web.archive.org/web/20070307084013/http://www.fcac-acfc.gc.ca/eng/publications/CreditCardsYou/PrepaidCards_e.asp. Retrieved 2008-01-09. document: "Pre-paid Cards" (pdf). Financial Consumer Agency of Canada. http://www.fcac-acfc.gc.ca/eng/publications/CreditCardsYou/PDFs/Prepaid-e.pdf. Retrieved 2008-01-09. ^ "Cash Advance Fees". http://www.credit.com/slp/chapter4/Cash-Advance-Fees.jsp. Retrieved 2007-07-12. This page was last modified on 8 April 2010 at 02:16.